Low-Carb Cinnamon Bundt Cake (Dairy-Free) - Low-Carb, So Simple! | Low-Carb, So Simple! Making this cake is very simple. Actually, it’s hard to believe that such a delicious cake has only a few ingredients — and so little carbs! There are two important things to keep in mind when making this cake. First, the dry ingredients should be well mixed so that there are no lumps of almond flour, baking powder or cinnamon. Secondly, the mixture of beaten eggs and erythritol should be fluffy. Very fluffy. Thick, and almost white. I recommend to use a rubber spatula for folding the dry ingredients into the egg mixture. In my experience it works better than electric mixer. Just be sure to mix along the bottom, the dry ingredients tend to sink there. I have a silicone bundt cake pan, which doesn’t necessarily need greasing. However, to make the removing of the cake easier, I brush the pan with melted coconut oil. 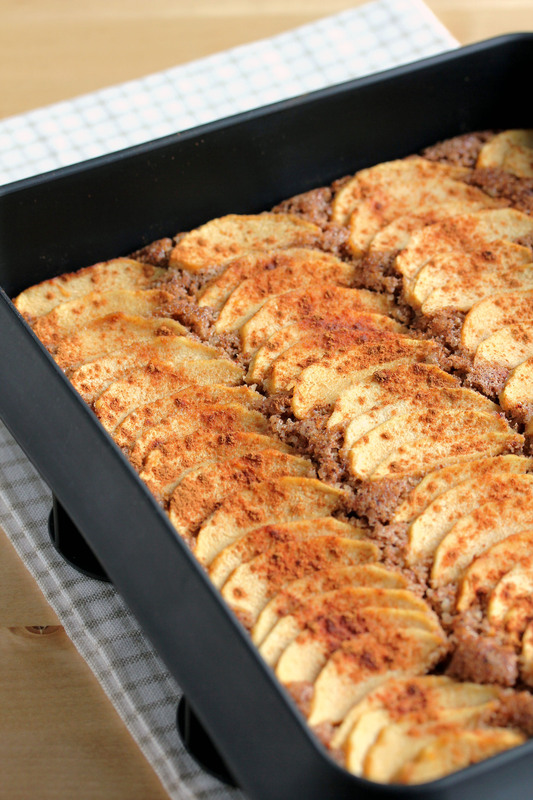 I published a recipe for Low-Carb Cinnamon Apple Cake in my Finnish blog. I was thrilled with the idea of modifying the recipe to bundt cake recipe. Basically I just omitted the apples, and adjusted the amount of other ingredients. First I used 5 eggs and 2 cups (480 ml) almond flour. The resulting cake was fluffy, but it got dry very fast, even I stored it covered. I increased the amount of almond flour to 2½ cups (600 ml), and that worked well. I also tried with 3 eggs and 2 cups (480 ml) of almond flour. That made a bit too small cake, but I think the amount is ideal if you want to bake the batter in muffin cups or in a mini bundt pan. Grease a bundt cake pan for example with melted organic extra virgin coconut oil. In a large bowl, combine the almond flour, cinnamon and baking powder and mix well. In another large bowl, combine the eggs and the erythritol and beat with an electric mixer until almost white and really fluffy. This usually takes several minutes depending on how powerful mixer you have. Fold the almond flour mixture gently to the egg mixture preferably with a rubber spatula until the batter is smooth and the dry ingredients have well mixed to the wet ingredients. Pour the batter into the greased bundt pan. Bake for some 40 minutes, or until a stick inserted into the center of the thickest part of the cake comes out clean. Let cool, remove from the pan and cut into slices. Serve as such, or top with a dollop of whipped cream or cream cheese icing (count extra carbs if needed). Sprinkle some extra cinnamon on top. 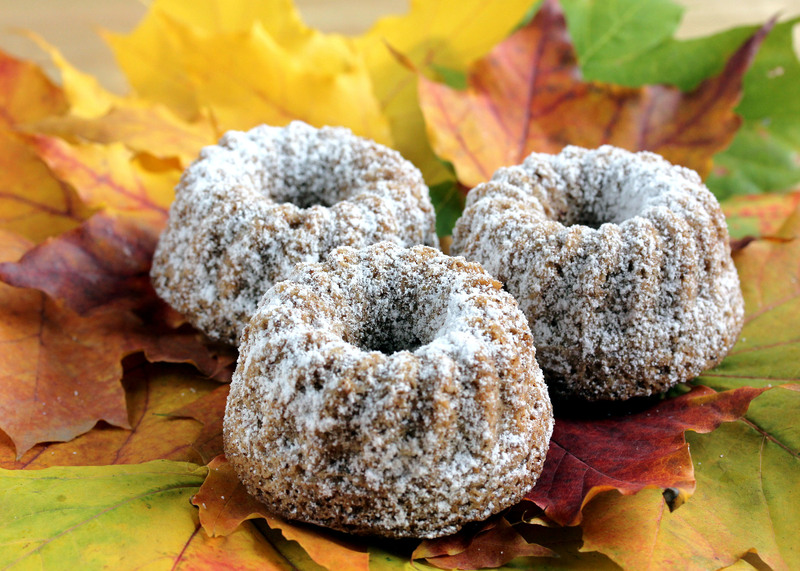 Individual bundt cakes: Make individual bundt cakes by baking the batter in a mini bundt cake pan. In case you don’t have a mini bundt pan, you can bake individual cakes in muffin cups. 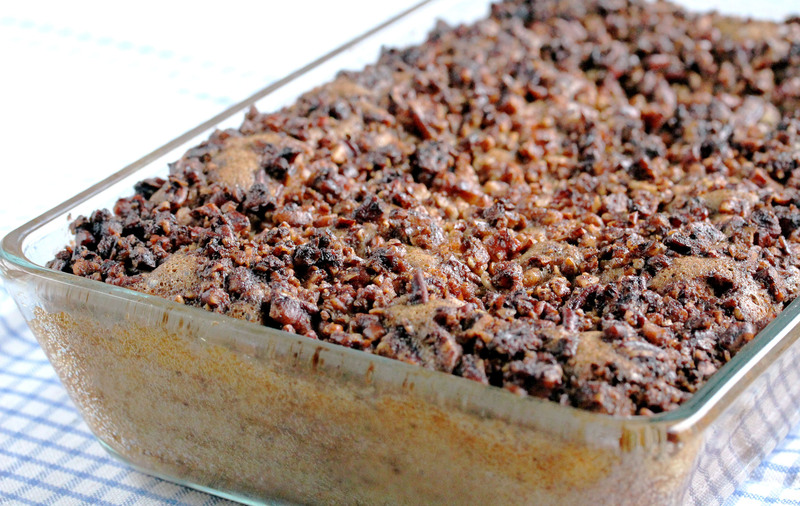 Coffee cake: Bake the cake in a glass or ceramic baking dish. Sprinkle some streusel on top, just before putting the cake in the oven. Prepare the streusel before the cake batter. Combine all the streusel ingredients in a medium bowl. Mix well with a spoon. Set aside. Prepare the cake batter, pour into the greased baking dish and sprinkle the streusel on top right before putting the cake in the oven. Bake as directed. Cinnamon Apple Cake: Pour the cake batter into a greased glass, silicone or ceramic baking dish. Add 7 oz (200 g) peeled and sliced sour apples on top. Sprinkle the apple slices with cinnamon and erythritol to preserve the juiciness and to enhance flavors. Bake as directed. I made this today and it is delish! I made it in an 11×9 1/2inch glass pyrex and gave it almost 50 minutes. I used the weight measurements for almond flour and sweetener (I used monk fruit). I also added the streudel, which I modified since my family doesn’t like chunks of pecans. Instead I used a packet of instant gluten free organic oats and 1/2c of almond flour (I probably could have added more, but it still worked and was pretty yummy!). My 7 year old and one year old scarfed two pieces down almost right out of the oven. I used baking stevia with some fine turbinado sugar, but it came out too dense. I made a second batch with a reduced amount of the stevia and increased the turbinado and added some maple syrup. I added an extra egg since I had farm-fresh eggs of varying medium-to-large size. Second batch came out much better, as it browned deeply and was not as dense as the first batch. I used Bob’s Red Mill super-fine almond flour, so I suspect a coarser milled flour will make it even fluffier. Great recipe! i made this for the 2nd time and again, it came out very dense and didn’t rise at all. i had to scoop the batter. it didn’t pour. I would love to have it come out fluffy, but how???? Sorry to hear it came out dense 🙁 The batter should be really light and fluffy. Did you use coarse almond flour? Too fine almond flour might make the cake dense (or if you use very fine almond flour, you might want to use just half of the amount). i used Bob’s red mill super fine almond flour. I guess i’ll try it again with course flour. Yes, it should make a difference. I made this for a colleague’s birthday cake yesterday morning, and added a Nutella frosting (mostly low carb). It was so good I made another batch in the evening, to share with friends and family. Great recipe! Thank you so much for sharing. You’re welcome! Sounds great with Nutella! I tried it but somehow for me it didn’t brown so well and I used lakanto (erythritol and monk fruit) but the Fakhoury was just not nice. The crust was nice and the cake was moist but a miss for me. Don’t know what went wrong. Perhaps cos I have a fan cooled oven I should have reduced the temp? How long should you bake them for if you are doing them as muffins? If I remember right, I baked muffins for some 25-30 minutes at 300 °F (150 °C). Hope this helps! This looks so very good!, just love all of your recipes! Next time I’d like to try and add a bit of shredded apple to the cake itself. Maybe bake in a 13×9 pan with the streusel topping. Do you think the cake can support adding some shredded or small diced apples into the batter, as opposed to placing the slices on top? Also wondering if this recipe, minus the cinnamon, could be used as a ‘base’ recipe for perhaps a chocolate cake with the addition of cocoa powder, or a lemon cake with the addition of extract and zest? This is fantastic, a great result for so few ingredients and little carb. I have just tried it again with the apples on top (using the proportions on the Finnish blog) but substituting some of the almond flour with pea and whey protein powders to get a higher protein version. I added a little 0% fat greek yoghurt to keep things moist and it worked really well. Thank you so much for the excellent recipe! Thanks, Claire for trying out! Great that it succeeded. Here in Finland we don’t use that much pumpkin either, but it’s getting more and more popular. I indeed have directions how to roast pumpkin, you will find it when you scroll down the page that contains all the recipes. I love all of recipes! and this one looks so good!. What sized pan would a person use if he/she were making the apple cake? 9×13? Hi Joanna, I think I used 8×10 pan (Lékué silicone lasagna pan) when I made apple cake. I would say the cake was some 2 inches thick. However, I think I would use rather 9×13 pan than for example 8×8 pan. Hope this helps! can i use coconut flour instead of almond flour? thats all i have and can i use stevia instead of the crystals? Hi Angela, unfortunately coconut flour won’t work here as it works completely different from almond flour. It absorbs insane amounts of fluid compared to almond flour. You can try some other nut flour, but the taste might be too strong. 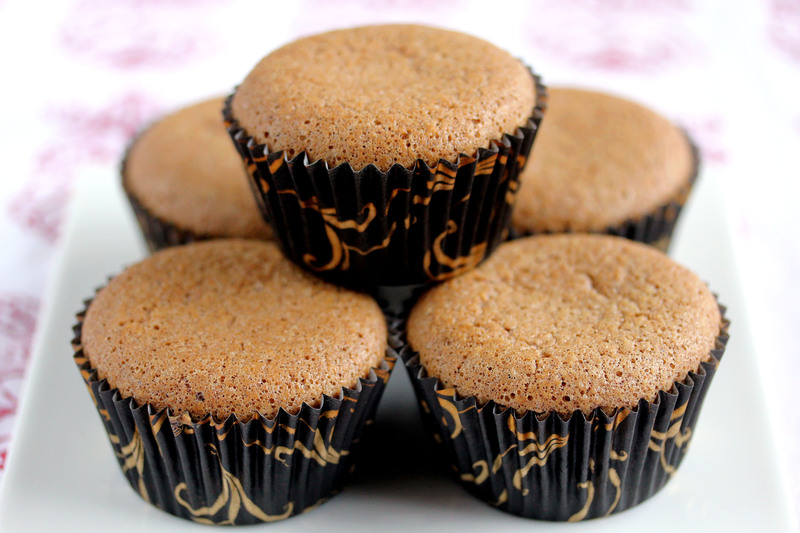 Almond flour has quite neutral taste and thus is great in baking. Hope this helps! Can I substitute Truvia for erythritol crystals? I am still very new to low carbing and some ingredient substitutions are kind of confusing but I’m doing it for health reasons and so far have lost 30 lbs! Hi Terry and congrats on the remarkable weight loss! Truvia should work very well here, though I expect it to be a bit more sweeter than pure erythritol crystals. But since it contains mostly erythritol, it should work well. Thanks Elvira, can’t wait to try it! I do have be very low carb in my diet but I prefer raw honey as a sweetner. Has anyone tried that? And if so, how much? Thanks! Hi Chris, raw honey indeed is very natural, though quite high in carbs. I would also like to hear if somebody has tried to sweeten this cake with honey. The sweetness of erythritol is 60-70% from that of table sugar, so I think you can use less honey here to get preferred sweetness. I just calculated that if you use 1/2 cup (120 ml) honey to sweeten the cake instead of erythritol, the net carb count for the whole cake is 164.4 grams. That makes 8.2 grams net carbs for a slice if you get 20 slices from the cake. If you use 1/3 cup (80 ml) honey to sweeten the cake instead of erythritol, the net carb count for the whole cake is 116.8 grams. That makes 5.8 grams net carbs for a slice if you get 20 slices from the cake. However, I haven’t tried out how the cake turns out if you use honey and how it affects to the texture. Wow…thanks for the quick response AND calculations. I know honey isn’t the best but didn’t realize that it would wipe out the protein benefit. I should be at a 2 to 1 ratio (protein to carbs). But since this is not something that would be eaten on a daily basis it might be a nice treat once in a while. I hate using artificial sweetners so maybe I’ll give the crystals a try since they are natural. Thanks again..appreciate your help!! I’m allergic to almonds, to the point I have to watch shampoo ingredients too. Is there anything else I can substitute the almond flour with? This looks really good and as my carb limit for the day is only 10-15 net carbs, I’m always looking for low carb recipes. The guest blog of the fat bombs is great, had 1 at lunch today. Thank you for all your help and I’ve only just found you. Keep up the great work and encouragement. Hi Theresa, thank you for your comment. I’m very pleased to hear that you like my recipes. In this particular recipe almond flour plays a very important role. I doubt it can be replaced directly with anything else. Do you tolerate coconut? I could try to create a fluffy cake recipe using coconut flour. That has been anyway my plan for a long while. How about nuts and nut butters? Are they okay for you? Or whey protein? After a year of gluten free baking for my strick vegan son, I’ve decided to try using erythritol for my low carb diet and for my diabetic husband. This was such a GREAT success. It was light, moist, yet substantial due to the almond meal. After so many flops trying to find/create palatable breads and sweets without using eggs, I didn’t expect anything so perfect. I followed the recipe only using 6 large eggs for the 5 extra large and powdering the erythritol. I also topped hubby’s “half” with the streusel. I was confused about size of pan. Based on the links, I assumed 11″ x 7″. I couldn’t fit all the batter in my pan. It was probably not deep enough. I had a very full 11 x 7 cake plus two custard cup sized cakes. I want to say a special thanks for giving the nutrient charts on the recipes. I usually figure them out for myself (I’m low carb but have to watch calories, too). This really helps . Can’t wait to try more. Hi Rhea and thank you for your comment! I’m sorry for not mentioning the size of the pan. I’ve used quite a large Lekue silicone pan, and I simply should have measured that myself and give the measures in the recipe. But I’m very happy to hear that you were so satisfied with the cake! Hope you like my other recipes, too! This bundt cake looks so easy and yummy. I’m assumining it would be considered gluten-free because of the use of the Almond flour, is that correct? I am not familiar with using Erythritol. Could you share any info regarding this sweetener. If I wanted to use my coconut sugar would I use the same amount to replace the Erythritol? Hi Annmarie! Thanks for your question. Yes, you’re right, this Bundt cake is gluten-free because of almond flour. You can find more information about erythritol e.g. from Wikipedia: http://en.wikipedia.org/wiki/Erythritol. It’s pretty natural sweetener and low in carbs. I buy my erythritol from iHerb, you can find the link from the recipe ingredients. Personally, I’ve found that erythritol and stevia are the most natural and best tasting low-carb sweeteners. Coconut sugar contains plenty of carbs, but if you tolerate more carbs, please feel free to use coconut sugar. Because erythritol is 60–70% as sweet as table sugar, I would recommend to use less coconut sugar in this recipe. I would start with 1/2 cup (120 ml) coconut sugar. However, I cannot say if coconut sugar makes different texture to the cake. If you try out this cake, please tell me how it turned out and how you liked it! Thank you! Oh, peaches are so delicious… I’ve always thought their carb count is unbearable, but after checking again, they actually contain less carbs than apples! Coffee cake just came out of the oven…tasted great. I used 2 eggs, 2 flax eggs, and 2 egg whites. I used sunflower oil instead of coconut oil & also added 1/2 cup of rolled oats to streusel. The next time I will use chia eggs instead of flax since the almond is already grainy and post results. Hi Glenda, sounds good! Thanks for sharing your experiment! Great to know that the cake succeeds also with less eggs and with some flax eggs. Can you use egg replacer, either flax or chia? I’m watching my cholesterol and this is way too many eggs for me. Hi Glenda, I haven’t tried egg replacer and I really doubt it would work here. I guess you know that eggs are not culprits for the high bad cholesterol levels? Baked this today. Added 1 cup of fresh blueberries that were tossed with 2 tsp of erythritol crystals. The cake unmolded beautifully from metal bundt pan. Served with fresh whipped cream and more fresh blueberries. I made this last night as the coffee cake with the streusel on top. OMG it was so good! I used 5 large eggs and 2c of almond flour as you suggested. The cake falls apart somewhat, but no one cared because it was so delicious! Any suggestions on better congealing next time? Pinch of xanthan maybe? I might double the streusel as well next time or maybe at least 1.5 times the recipe of it. Hi Deana, I just calculated that the streusel adds 17.3 g protein, 167.6 g fat and 8.2 g net carbs to the whole cake. Hope this helps! Yes it does, thank you very much! I am making this for dessert tomorrow night and will be using large eggs. Should I use 6 you think? If so, do I need to adjust any of the other ingredients as well? You’re welcome 🙂 I think I would use 5 large eggs and 2 cups (480 ml) almond flour. I think I wouldn’t change the amounts of other ingredients. Hope you like the cake! Hello, this looks wonderful, except that I am doing a Paleo diet which basically eliminates all fake sugars, was wondering if you had any idea if I could use coconut crystals or date sugar in this? Is Erythritol sugar acts like cup for cup or is it much sweeter than any other sugar? Hi Lucy, thanks for your comment. I’m sorry, my knowledge about Paleo diet is not that good even I have tried to learn something about it… So Paleo diet doesn’t allow erythritol even it occurs naturally for example in melons, grapes, mushrooms and fermented foods? Industry produces it from glucose by fermentation with yeast. Erythritol is approximately 70% as sweet as table sugar. Does Paleo diet allow any sugar alcohols like xylitol? How about stevia? If you try out the cake with coconut crystals or date sugar, please tell me how it turned out! Actually, Paleo DOES allow TRUVIA and other Stevia/Erythritol sweetners, as well as the sweetners like “Monk Fruit In The Raw”, “Stevia In The Raw,” and like I said Truvia. As Stevia comes from a plant, it is NOT artificial like Maltitol, Sucralose(Splenda), Aspartame(Equal), and the “Sweet and Lows.”Agave and honey are also encouraged, though if you are on a low-carb diet, it is NOT advised, or use in moderation. I have been on Modified Atkins(a low-carb, high fat, high fiber diet) for several years now for control of Epilepsy and I am always looking for new recipes, I recently mixed Paleo in with my Modified Atkins-since my aunt, who is board certified in nutrition and a chiropractor, told me to do so because it would help me more. I have been very well controlled on this diet combination(though both are different Ketogenic Diets technically). I make a lot of health food with this diet and TRY my hardest to get organic food to cook with. Thank you for your comment. Great to hear that you too have found help from the ketogenic diet! May I ask why do you consider maltitol artificial? I made the cake in a bundt tin and it worked beautifully but it is very crumbly. I would like it a little more dense but have no idea how to change. I love the idea of making it into a pudding with sreusel on top and in fact will make it this weekend for guests. I wondered also if choc powder could be used in the cake instead of cinnamon. I am a type 2 diabetic so am always enthusiastic when I find a good recipe.and adore chocolate. Hi Libby, sorry for the delayed answer. I wonder if there was too little almond flour if the cake was crumbly. At least according to my experiments the more almond flour the more dense the cake. I’m sorry, but I cannot say if you can replace the cinnamon with cacao powder just like that. I would need to experiment that first myself. Great to hear that you like my recipes. Can you use gluten free flour instead of the almond flour. 1) Yes, you can do your own almond flour as long as you use blanched almonds and you get finely enough texture for which you need a very powerful food processor. 2) I doubt gluten-free flour woks here. The measures are so different compared to almond flour. However, I haven’t tried out other than almond flour for this recipe. I like the look of your cinnamon bunt cake. I would like to substitute the erythritol with honey or maple syrup. Any idea how much I would need to substitute? Hi Josephine, unfortunately I cannot say how much to use honey or maple syrup. Unlike erythritol, those are more or less liquid, which means that the amount of almond flour might also need adjusting when using liquid sweeteners. I’m sorry but I cannot name any exact amounts because I’m not that familiar with using honey or maple syrup. I have a question about making the muffin way. How long to cook the mini bundt or muffins for. Hi Debbie, I checked my notes but unfortunately I haven’t written that down. However, I remember I baked the muffins for some 25-30 minutes at 300 °F (150 °C). Hope this helps. We made this bundt cake as one of the desserts we served at our Christmas dinner. Really yummy and SO easy to make. Thanks for all your fabulous recipes! Tara, thanks! So great to hear that you liked the cake! Merry Christmas to you and your family! I am thinking about making this cake for our American Thanksgiving feast. I was wondering if you think it would turn out well using unblanched almond meal, or if I need to buy blanched almond flour? Hi Tara, I haven’t tried this cake using unblanched almond meal. However, I would expect it won’t bring good results since the flavor and the texture differ a bit from the blanched almond flour. So I would recommend blanched almond flour for the best results and that the cake for sure turns out perfectly. Elviira, I made this awesome cake last week using 1/2 almond flour and 1/2 almond meal. It turned out super! 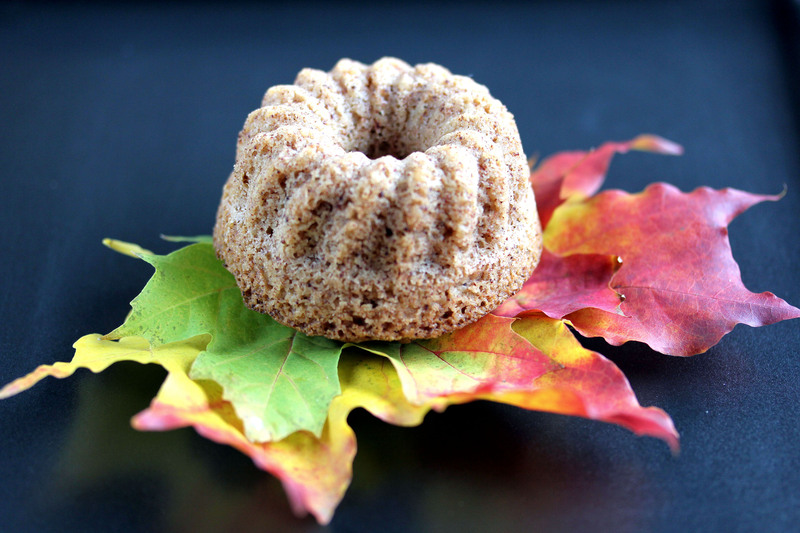 Your Pumpkin Spice Muffin recipe is a favorite of mine, so this morning, I threw it together for a Bundt cake. After it baked, I covered it with a towel before leaving for work for the day. To be honest, it didn’t look totally baked in some spots, but perhaps it would have continued to bake as it cooled. I’m sure it’ll will be fine! 🙂 I want to stress: Both of these recipes are simple to assemble and delicious (and I’ve used strictly almond meal a couple of times)! Simple, budget-conscious and delicious … for me, it doesn’t get any better than that! Thanks so much, Elviira!